Four-bladed sound – For the fainthearted . . .
← Which news is fake? The downbeat of the rotors was something sensed physically; the grass was flattened, sheep and lambs flocked together in fear. There were always helicopters. The Westland factory at Yeovil, a Royal Naval air station at Yeovilton, the sound of engines was rarely far away. Helicopters could be benign, built for air, sea rescue, or civilian transport. But more often they came with overtones of violence; they were for anti-submarine warfare, or ground attack, or bringing heavily armed commandos into combat zones. A helicopter might pluck a seafarer from a stricken vessel, but might also launch lethal missiles at an enemy target. 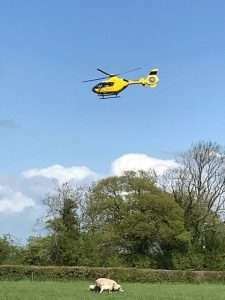 In rural Ulster, the thud-thud noise of a Wessex helicopter overhead meant only one thing, an army patrol about to land. Sometimes in a field across the road, sometimes in the paddock to the rear of the house, soldiers in full combat equipment would leap from the side door and rush to positions of cover. At times, it was almost comical, they would stand at the gateway at the end of the drive and stop to inquire as to my destination; once there was even one crouched on the front doorstep, the sights of his automatic rifle focused on covering his comrades engaged in a checkpoint at the road. The patrol’s presence was always brief, to linger would have invited the risk of paramilitary attack. Before long, the Wessex would return and the soldiers would cover each other as they ran to join the aircraft that would carry them back to safety. In Dublin, helicopters might mark the extremes of society. Affluent racehorse owners and businessmen would avoid the traffic congestion of south County Dublin by flying into Leopardstown racecourse, the buzz overhead announcing the arrivals and departures of those for whom cost was no object. In places, the drone of engines in the sky carried connotations more sinister, the Garda helicopter hovering above a neighbourhood, its searchlight probing the streets and gardens, would seek those responsible for some serious crime. 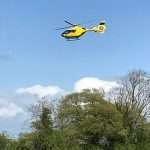 The helicopter hovered over electricity cables crossing the field, moving then pausing, moving then pausing. Its bright yellow colour declared it to be neither the military, nor the police, nor the air ambulance used to serve scattered rural communities. Instead it was the electricity service engaged in activity no more sinister than surveying the lines. At times it flew no more than a few dozen feet above the ground, at others it ascended before moving to the next line. Drones will soon succeed helicopters in many of their functions, war and surveillance. The downbeat of rotors will become the sound of a mission of mercy, or merely the transport of someone rich.